1. Game Night - Game night is always a fun way to spend a Friday or Saturday night with friends and family. How about mixing it up a little on your next regular game night by learning to play poker. You can Google poker games and learn a few together. Texas Hold’em is a blast and helps kids think through simple math problems to help them find the best hand. Talk about a win! 2. Pizza Night - We all love eating a delicious, cheesy pizza, but how about instead of ordering from your favorite pizza joint, you have a make-your-own-pizza night. We’re talking making the dough, including the awesome spin it into the air and catch it move, roll it out and top it with your family’s favorite healthy toppings and bake to bubble perfection. 3. Learn to Paint Together- There are plenty of how-to-paint videos on YouTube. Grab an inexpensive acrylic or oil paint set at your local art store and a few small canvases. Pop on a Bob Ross video and gather around to learn how to paint a beautiful landscape, babbling brook and happy little clouds together. 4. Pancake Art Contest - Pancake art is amazing and fun for the whole family. Grab some condiment squeeze bottles from your local dollar store, some all-natural food coloring and whip up some pancake batter. Separate the batter into the squeeze bottles and add a few drops of each color food coloring in every container. Shake them up and heat up the griddle for some pancake art fun. You can challenge each person to draw the same thing, then have a judge who determines whose design is the best, or just freestyle it and have everyone draw whatever they want and have an art contest. The best part? You get to chow down on your art project when you’re done! 5. Make Bath Bombs - Bath bombs can get a little pricey in the stores. Why not buy the ingredients in bulk and make them yourself? All you need is baking soda, epsom salt (which come in lovely all-natural fragrances like lavender or lemon and sage), citric acid, and coconut oil. You can use small cupcake tins as the molds. These make great gifts for birthday parties, baby showers and for mom for Valentine’s Day (hint hint). 6. Make a Living Room Fort - Break out a set of old sheets, the couch cushions and dining room chairs and make an awesomely amazing fort in the living room. Once you’re all done, grab a giant bowl of popcorn, pick out a favorite movie and snuggle in for a family fort film night. 7. Hide and Seek - We love this timeless, exciting game that just never gets old. Kids of all ages love hide and seek. Bigger kids can help the little ones find a hiding place before hiding themselves, which helps your older children practice leadership skills. 8. Build Legos - Lay a giant blanket out on the floor, dump a zillion Legos out on the blanket and have your kiddos and their friends gather around and free-build to their heart’s content! You can also establish a theme based on holidays or a specific interest your kids have - like vehicles, camping, cycling, video games, etc. and build characters or items based on those themes. 9. Dance Party - Crank up the tunes and P-A-R-T-Y! 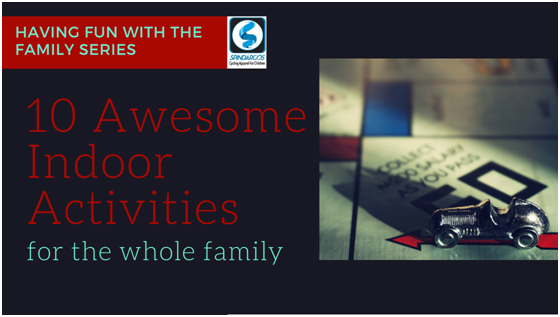 This is great exercise for everyone in the family and can really get the wiggles out on those days when the weather is just too darn nasty to venture outside for long. Have everyone pick a song, dance, dance, dance, then take turns until everyone has had a chance to pick out a favorite dance tune, start over until everyone’s too pooped to party any longer! 10. Arts and Crafts Night - Valentine’s Day and St. Patrick’s Day are coming up in the next couple of months and they just so happen to be two holidays with the most incredibly fun arts and crafts projects EVER! Everyone loves making valentines for their loved ones. And St. Patrick’s Day is super awesome for making all things green.